Be the first to share your favorite memory, photo or story of Inga. This memorial page is dedicated for family, friends and future generations to celebrate the life of their loved one. 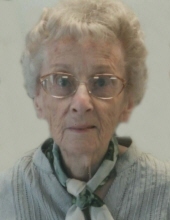 Inga Hanson, age 102 of New Glarus, WI formerly of Argyle, WI passed away Wednesday, April 10, 2019 at New Glarus Nursing Home in New Glarus. She would have celebrated her 103rd birthday on April 29th. Born on April 29, 1916 in Bagn Valdres, Norway, the daughter of Andrew and Elise Lien. The eldest of 10 siblings. She came to America March 20, 1920. Inga attended Meadow Brook School in Adams Township and Meadow View School in Perry Township then attended Blanchardville High School. After her freshman year of High School, Inga stayed at home and helped with farming then worked as a hired girl for farm families in the neighborhood for several years. She was united in marriage to Raymond Hanson on October 6, 1937 at the Blanchardville parsonage. Inga farmed with her husband in rural Blanchardville until moving to the village of Argyle in 1992. Inga is survived by three children: Carol (Homer) Pickett of South Wayne, WI, Betty (Dennis) Severson and Duane (Jane) Hanson both of Blanchardville, WI; 11 grandchildren: Terry, Dan, Larry Pickett, of South Wayne, LuAnn Hutson of Sparta, WI., Lori Severson, of Brooklyn, WI, Cari Severson of Footville, WI, Joni Eaton, of Somonauk, IL., Barry Severson of Green Bay, WI, Todd and Tim Hanson of Blanchardville and Beth Sigg of Mineral Point, WI; many great-grandchildren; and many, many great-great-grandchildren; four siblings; Claire (Jo Ann) Lien of Stoughton,Gudrun (Delbert) Kundert of Monroe, WI, Gunvar Haesler of Darlington, and Alice Voegeli of rural Monticello, WI. two sisters-in-law: June Beck of Racine and Barb Lien of Blanchardville. She was preceded in death by her parents; her husband on April 14, 2002; three sisters: Olga Ommodt, Marie Henning, and Ruth Stillman; and two brothers: Ole and Ardell Lien. Inga was a member of Yellowstone Lutheran Church and ELCA, and was part of the church Choir along with husband, Ray, for fifty years. She loved music, singing, dancing and playing cards with family and friends. Ingas hobbies were; knitting, crocheting, quilting, cooking, and baking Norwegian delicacies. She cherished the time she spent with her family and the memories they created together. Inga will be sadly missed and fondly remembered by her family and friends. A funeral service will be held Tuesday, April 16, 2019 at 11:00AM at Yellowstone Lutheran Church (4472 Saints Road, Blanchardville) with Rev. Daniel L. Bohlman officiating. Burial will be in Yellowstone Lutheran Cemetery. A visitation will be held Monday, April 15, 2019 from 4:00-8:00PM at the Erickson Funeral Home (801 Milwaukee St., Argyle) also at the Yellowstone Lutheran Church from 10:00AM-10:45am. The Erickson Funeral Home in Argyle is serving the family. Online condolences may be expressed to the family at www.ericksonfuneralhome.com. For those who prefer, a memorial fund has been established in Inga’s name. To send flowers or a remembrance gift to the family of Inga Hanson, please visit our Tribute Store. A visitation will also be held Tuesday, April 16, 2019 from 10:00 A.M. until 10:45 A.M. at Yellowstone Lutheran Church. memorials may be written out to "the family of Igna Hanson"
"Email Address" would like to share the life celebration of Inga Hanson. Click on the "link" to go to share a favorite memory or leave a condolence message for the family.